Cleopatra’s Needle, standing tall overlooking the river, is one of a trio of obelisks, the other Needles being located in Paris and New York. 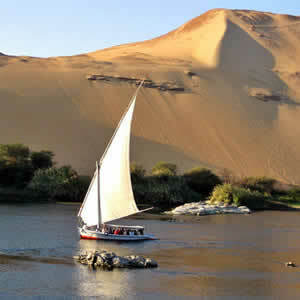 All are made from pink granite, are inscribed with Egyptian Hieroglyphics and stand 60-feet (18-metres) high. 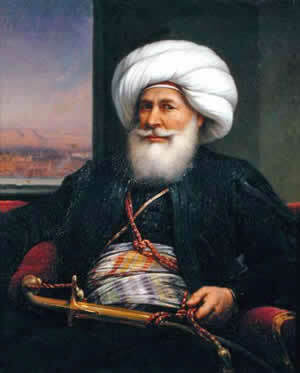 The London needle was presented to the United Kingdom in 1819 by Mehemet Ali of Egypt, in recognition of the victories of Lord Nelson at the Battle of the Nile and Sir Ralph Abercromby at the Battle of Alexandria. 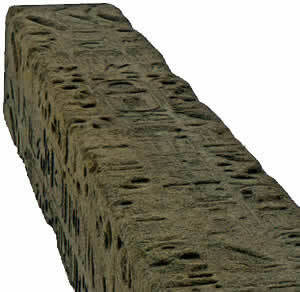 Cleopatra’s Needle originated from quarries near Aswan in Egypt and was originally erected in Heliopolis in around 1450 BC. It was later moved to Alexandria by the Roman Emperor Augustus, where it stood until it toppled over some years later. Buried and protected in the sand, the obelisk remained in Alexandria for nearly 2,000 years, until 1877 when it was dug out and encased in a great iron cylinder. The cylinder was given a vertical stem, a stern, a rudder, two bilge keels, a mast for balancing sails, and a deck house. This acted as a floating pontoon, which was called Cleopatra, and was towed, to London by a ship called Olga. The trip to London was not without incident. Disaster struck in the Bay of Biscay, when the Cleopatra capsized in a storm, with the loss of six lives. The Cleopatra did not sink but instead drifted into the Bay until it was rescued by a British ship and taken to Spain for repairs. 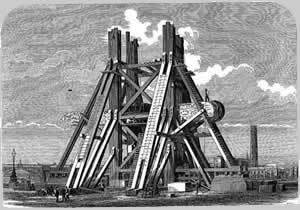 It finally arrived in London in January 1878, with the obelisk erected on the Victoria Embankment the following August. A time capsule is buried in the foundations of the needle and contains Victorian newspapers, railway timetables, a set of Empire coins, Imperial weights, Bibles in different languages and a set of 12 photographs of the best looking English women of the day! 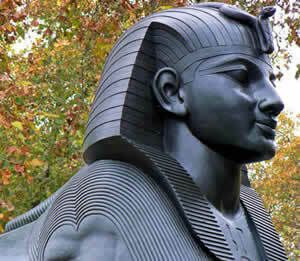 Cleopatra's Needle is flanked by two Egyptian sphinxes, added in 1882 and cast from bronze that bear hieroglyphic inscriptions. 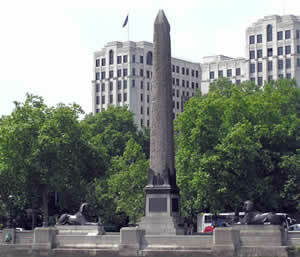 In 1917 the Needle became the first London monument to be hit in an air raid. The damage remains un-repaired and is clearly visible in the form of shrapnel holes and gouges on the right-hand sphinx. 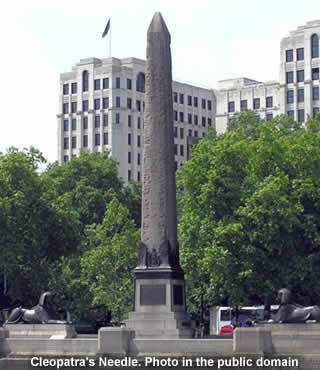 Cleopatra's Needle can be found on the Victoria Embankment.